New T3 Affinity display system proves an ‘absolute winner’ for Irish company. One of the very first T3 Affinity display systems has been installed by Irish marketing, design and print specialists Absolute Graphics. It was supplied by UK based Tecna Display in March. Absolute Graphics, based in Bray, County Wicklow, covers every aspect of client requirements from concept and graphic design through to finished printed product. Its slogan, ‘your brand - our passion’ typifies the company’s philosophy to provide superb quality work with a complete focus on customer needs. Dermot Malone, a director at Absolute Graphics, explained the background. T3 Affinity was launched at the end of February 2016 at Exhibition Live in Las Vegas, USA, and subsequent interest in its potential and flexibility for the exhibition market has been high. Designed and developed by Tecna Displays Ltd, it is billed as a new and unique solution built around the globally recognised T3 system. “Our brief was to deliver seven equal stand areas for different sections of the HSE to use,” continued Malone. “The challenges we faced were that the room was on a first floor level with a very small lift for access, and it had very low ceilings at just 2.4m, so a standard type shell scheme simply wouldn’t fit. “The brand new T3 Affinity system proved to be an ideal solution as we were able to choose a flexible configuration so that the uprights could be just under 2m in height, allowing room for two LED spotlights to connect on top of every stand space and we chose two 1.2m cross bars for each booth. “The client only wanted 0.5m returns on each side, so we recreated the curved wings that we’d seen on the Tecna website, which was also a great opportunity for some branding for the event. 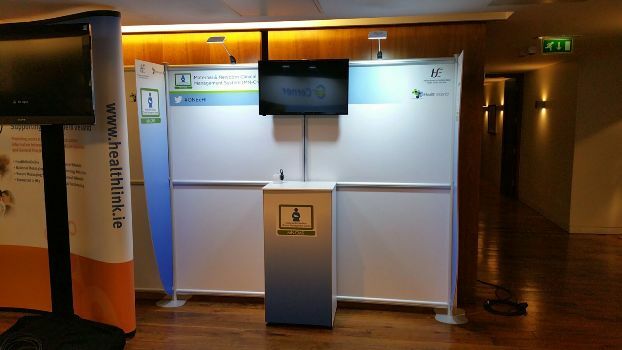 “Each individual booth used four 1m x 1.2m panels which were easily transported in the small lift, and for the two that requested it, we used the standard T3 monitor hooks. We also linked the Affinity uprights using the new connector to our standard T3 bars to create a podium for laptops, which gave the system extra stability. For more information on T3 Affinity, visit Tecna Displays on stand H66 at Sign & Digital UK (19-21 April, NEC Birmingham) or visit www.t3affinity.com. T3 Affinity will also be available through Tecna Display’s UK distributor; Tecna UK Ltd.